Waterproof and sanitary construction models available. 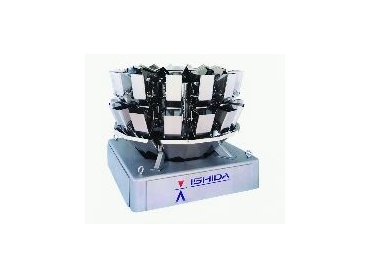 ISHIDA's new CCW-R multihead weigher combines high-tech advancements with unique and user-friendly operator controls to maximise the performance of your packaging line. * Speeds up to 180 weighments per minute. * Control unit with Windows XP operating system and e-mail capabilities. * Capability for full integration and monitoring of other equipment on the line through single panel operator interface. * Automatic timing settings that optimize productivity and reduce operator inputs. * Unbeatable Ishida weighing accuracy. * Waterproof and sanitary construction models available. Faster digital filtering and new calculation methods prevent missed cycles and increase weighing speeds and accuracy. New feeder controls stabilise product flow across the top of the weigher for higher production efficiency. Engineering innovation has refined the performance of feeder drives to such high degrees that energy consumption has actually been reduced by almost 50% over earlier models. The improved operator control unit runs with Windows XP, allowing e-mail communication from the panel. Product photographs in the operating presets, taken with a built-in camera, simplify operator setup for the next production run, simply select the product from the menu, and its preset operating parameters are there. And if you have questions during setup, Ishida's unique "System Assistant" tutorial can guide you with easy-to-flow procedures. Ishida also advances system integration capabilities with the new CCW-R, allowing control of the Ishida weigher, bagmaker and checkweigher on a line from any one of these individual machine's control panels. Single panel interface of the line can even be extended to include other manufacturer's equipment. For higher productivity and the industry's most innovative, user-friendly and efficient operator controls, contact us about packaging systems from Heat and Control/Ishida.